Best Place To Get Started Farming? Two couples say they are finding opportunity in the West. Where's the best place for young people to get started farming and ranching in the Dakotas these days? J.T. Moon says it's in the West. He operates a ranch with his wife, Jami, near Wall, S.D. 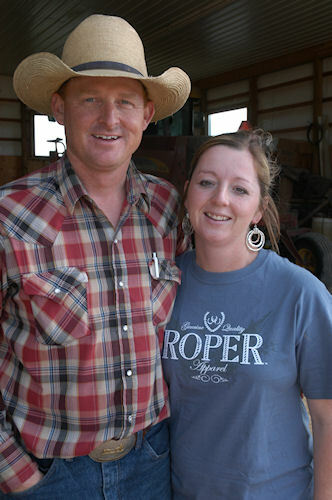 Both are in their 30s and have been farming and ranching for about five years. "We have cheaper land, but it is still pretty productive," J.T. says. "You can do very well in a good year." Land costs $600-$800 per acre and no-till winter wheat is yielding 50-70 bushels per acre this year. The Moons also grow safflower, alfalfa and corn and run about 350 head of stock cows. They background calves and retain ownership of some of the steers through finishing. Jamie grew up on the ranch that they are operating, but J.T. is from Montevideo, Minn. His family's farm was small and he would have had to buy a substantial amount of land to get started. Given the large farms in the area and the competition for land, which is now selling for $5,000 or more per acre, J.T. figured he didn't have much of a chance back home. He went to Wall for a job at a feedlot, met Jami at a branding and – as they say – the rest is history. "We have to deal with a lot more weather risks in western South Dakota than in Minnesota," J.T. says. Drought is a constant worry and hail seems to hit parts of the county three out of five years. Grasshoppers can be a serious threat, too, but the Moons buy hail insurance, no-till to conserve soil moisture and manage their cash so they are in the best position possible to weather droughts and other problems that come their way. "This year looks like it might be a good one," J.T. says. "We've had a lot of rain and grain and cattle prices are up." 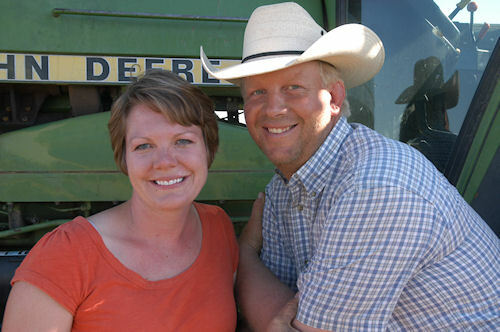 Monty and Bobbi Jo Williams, who also are in their 30s and ranch nearby at Box Elder, S.D., agree that the West is the land of opportunity for young producers. Monty's family is from the area, but has an older brother who took over the home place. Because the operation wasn't large enough to support another family, Monty started his career on a 40-cow, 620-acre eastern South Dakota farm, but there wasn't enough work to keep him as busy as he wanted to be. When his grandfather, who operated land in western South Dakota owned by an investor, retired seven years ago, Monty took his place in the partnership. Today, Monty and Bobbi Jo are managing 600 yearlings and 550 cow-calf pairs on about 13,000 acres. They are backgrounding calves, retaining ownership of calves in the feedlot and growing winter wheat, oats and alfalfa. They are also custom seeding and combining for neighbors. "There is a lot of opportunity, but it's a lot of work, too," Monty says. Both the Williams and Moons say they are happy just to have the chance to get started.